Walk into the new Southern California flagship location for location-based VR company Dreamscape Immersive, and the sights and sounds of the bustling shopping center it’s located in quickly fade away. A large clock hangs over a wooden concierge desk, while a pair of monitors advertises “departure times” for the location’s trio of immersive experiences, using three-letter abbreviations that echo an airport more than a movie theater or arcade. The transition away from reality continues in the location’s waiting lounge, where physical artifacts from the worlds explored in titles like Alien Zoo and Lavan’s Magic Projector: The Lost Pearl await examination. The props set up backstories and plot details well before audiences get anywhere near a headset or backpack computer, and by the time guests are ushered into the gear-up rooms — designed to echo train cars, decked out in wood and soft overhead lighting — it’s tough to shake the feeling that you’re doing more than stepping into a virtual reality experience. This feels like a journey. It’s a thought-out, cohesive approach that pulls heavily from the lessons of modern-day theme park queue designs. And as Dreamscape readies an expansion into AMC movie theaters, the company hopes it will be one of the keys to selling a sometimes-skeptical public on the power of virtual reality. As for the VR experiences themselves, Dreamscape’s approach feels like a cousin to the work of location-based VR company The Void. 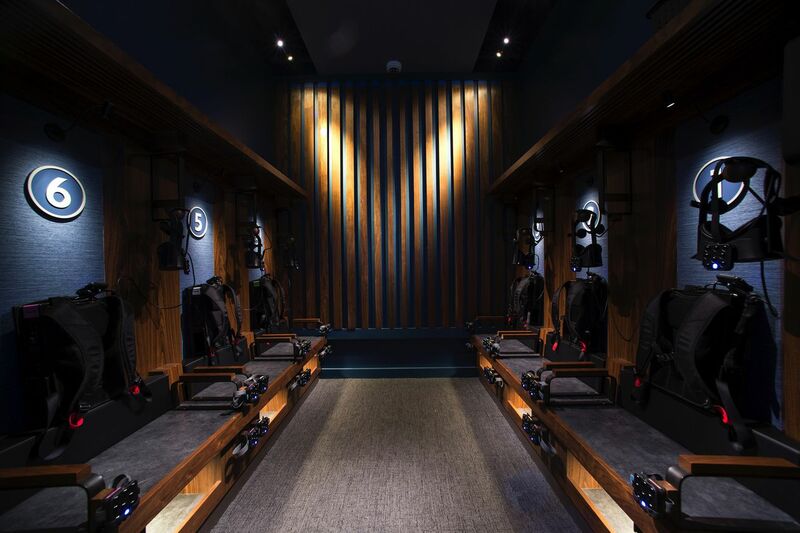 Groups of up to six guests are outfitted with backpack computers, headsets, and hand and foot trackers and are then ushered into a 16-foot by 16-foot walkable space equipped with a vibrating haptic floor. (There are five such “pods” at the Westfield Century City flagship location, including one that will simulate flight, though only three are currently active.) That’s where the VR experience begins, with guests appearing in the digital world as full-bodied avatars. From there, they’re taken on a journey where they can physically touch and feel objects they see through their headsets. Along the way, other senses are engaged with smells, mist, or wind, further grounding the digital experience. Tickets run for $20, and the experiences clock in around 15 minutes each. The title Alien Zoo, for example, takes guests on a dark ride-style tour of an orbiting interstellar habitat where they may actually pet aliens. The Blu: Deep Rescue, the latest iteration in Wevr’s underwater VR series, casts the group of players as undersea explorers who need to find and rescue a lost whale — an adventure that includes individual missions on underwater “scooters” where guests cling to vibrating, responsive handlebars. And Lavan’s Magic Projector is an Indiana Jones movie come to life, as guests armed with torches explore the ruins of an ancient temple for a lost artifact and end up on a mine-car ride straight out of Temple of Doom. The natural inclination is to compare Dreamscape’s work to other mixed-reality hybrid experiences. I found the Dreamscape experiences to be a little less polished than something like The Void’s Star Wars: Secrets of the Empire, with occasional graphic glitches and the lack of individual finger articulation testing my suspension of disbelief at times. There’s also less consistency when it comes to physical objects: more often than not, when a guest sees a wall or physical item in a Void experience, they can definitely touch it. That’s less certain in Dreamscape experiences. The walkable space in each pod is encircled by railings that are heavily incorporated into the various VR worlds, but I did frequently reach out to touch various items — machinery in The Blu or a temple wall in Magic Projector — only to find that there wasn’t a real-world counterpart there. That may sound like a minor quibble, given that the point of virtual reality is normally to create a fantasy experience, rather than a physical one. But when the reality of a virtual world is specifically based on a tight integration with physical touch, even one misfire can be jarring. It’s the last thing designers want when their goal is immersing the audience entirely in the world of a given story. The rough edges do make it feel like Dreamscape’s experiences have room to mature. But they stand out in the realm of story and narrative. From the beginning, the company has touted its Hollywood creative power as a secret weapon. Parkes is a writer (WarGames, Sneakers) and producer (Minority Report, the Men in Black franchise), and industry titans like Steven Spielberg have consulted on Dreamscape Immersive’s projects. That mainstream Hollywood sensibility comes through in the experiences themselves. There’s a focus on theme and message that often isn’t present in other location-based VR titles, which can feel like arcade adventures rather than proper stories. Alien Zoo ultimately leaves audiences wondering about the larger implications of the way humanity is treating our own planet. The Blu: Deep Rescue is able to create an emotional bond between guests and the giant whale they’re trying to rescue. Magic Projector feels like a classic movie serial, with guests eagerly wondering about the next chapter and the fate of the creator of the titular projector. The approach is intentional, Parkes and Vaughn say, born out of their desire to make the experiences as satisfying as possible to the largest possible audience. There is certainly an opportunity there if Dreamscape’s approach catches on. After the initial VR hype wave petered out, a lot of attention moved to location-based VR, with Disney investing in The Void, and IMAX launching its own VR locations, intending to eventually bring VR to movie theaters. The Void’s strategy has been paying off, with the company opening new VR centers across the US as it has rolled out projects based on Star Wars and Ralph Breaks the Internet, with a new Marvel-inspired experience scheduled for 2019. IMAX, on the other hand, opted for a simpler VR arcade model, using some titles that could already be played on a home VR setup. Without the benefits of the mixed-reality approach used by The Void and Dreamscape, the initiative failed to catch on, and earlier this month, IMAX decided to get out of the VR game altogether. That leaves Dreamscape, with a partnership with the AMC Theatres chain already in place, poised to capitalize. The company plans to roll out four installations at AMC locations by the middle of 2019, and it’s also looking into expansion into Europe and the Middle East with other partners. The aesthetics and designs being tested in the flagship location will be carried over into the AMC installations, turning the Los Angeles center into a testing ground to determine what resonates best with customers. In addition to the company’s original titles, Parkes promises that Dreamscape will soon be “adding truly world-class IP” to its lineup of offerings, all of which should make its take on VR more attractive as the number of locations grow, both with the first wave of AMC locations and well beyond. Dreamscape Immersive’s flagship location is now open in the Westfield Century City mall in Los Angeles.